CM Magazine: Text Styles series. 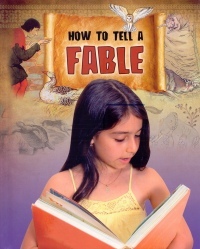 How to Tell a Fable. (Text Styles). 32 pp., pbk. & hc., $8.95 (pbk. ), $19.95 (RLB.). ISBN 978-0-7787-1635-8 (pbk. ), ISBN 978-0-7787-1630-3 (RLB.). How to Tell a Folktale. (Text Styles). ISBN 978-0-7787-1636-5 (pbk. ), ISBN 978-0-7787-1631-0 (RLB.). How to Tell a Legend. (Text Styles). ISBN 978-0-7787-1637-2 (pbk. ), ISBN 978-0-7787-1632-7 (RLB.). How to Tell a Myth. (Text Styles). ISBN 978-0-7787-1638-9 (pbk. ), ISBN 978-0-7787-1633-4 (RLB.). You have seen some of the different uses of dialogue. It can move the story forward, explain what is happening, and tell the reader about the character. But not all dialogue is spoken. Some characters think it without saying it out loud. Internal dialogue is usually marked with italics. By "hearing" what a character is thinking, we get a very honest look into their personality. This is very helpful when it comes to tricksters and villains. More often than not they are lying to the other characters in the story. Four titles comprise the new "Text Styles" series designed to teach elementary school children how to write specific kinds of stories. The books, each of which has 17 chapters, begin with a definition of the genre along with a brief explanation and history. Then a sample story is provided, followed by questions about the story and an analysis of character, dialogue, setting, plot and theme. Readers are invited to respond creatively to the story by means of suggested activities, such as designing a comic strip, creating a coat-of-arms, a mask or a board game, or acting out the story, just to name a few. A second story is presented, usually from another part of the world, followed by more analyses (e.g. story maps) and creative responses. Finally, readers are encouraged to write their own stories. To assist them in this task, the authors guide them through the writing process by means of step-by-step instructions and tips. The authors show examples of a first and second story draft, but honestly, there seems to be very little difference or improvement between the two drafts. Illustrations consist of coloured drawings, charts and photographs. A table of contents, an index, a glossary and a list of books and web sites for further study are included. How to Tell a Fable features Aesop's "The Boy Who Cried Wolf" and "The Blue Jackal", a tale from India which dates back to 300 B.C.E. Along with the information about character, plot, setting and theme, the author focuses on how to write dialogue and use punctuation marks to indicate when someone in the story is speaking. 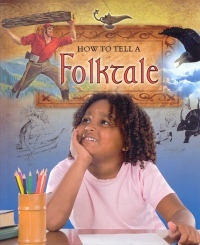 In How to Tell a Folktale, the featured stories are "Paul Bunyan Tames the Whistling River", an example of a tall tale, and "How Crow Brought the Sunlight", a trickster tale from Canada's Inuit people. This title focuses on inanimate objects, such as a river, as "characters", dialects, and how readers can learn a great deal about a character from the dialogue. Here, readers will also be introduced to writing in the first person versus writing in the third person. 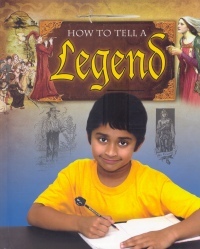 "The Legend of Johnny Appleseed", based on a real person, and "The Sword in the Stone", a legend about King Arthur, are the featured stories in How to Tell a Legend. Readers can discover a lot about a culture and cultural values by reading legends. In this title, the emphasis is on character traits and how a character's actions and words, as well as what others say about him or her, reveal a great deal. Readers will also learn how the choice of words in a dialogue, whether formal or informal, complements the setting. 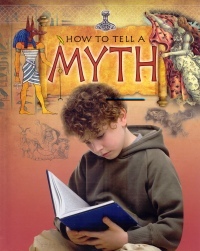 How to Tell a Myth includes "Old Man Coyote Makes the World", a creation story from the Crow people of the western United States, and "The Twelve Labors of Hercules", an ancient Greek myth about the first superhero. Major versus minor characters, heroes versus villains, and the development of character through dialect and "mind reading" (writing what the character is thinking) are some of the topics in this title. Using examples of stories to teach readers about the various components of a specific genre is a great idea. Good teachers have been doing this for years- reading folktales, for example, aloud to their classes and analyzing the various components together and recording them on a chart or some other type of graphic organizer, with the eventual goal being the creation of a group story at first, perhaps, and then having individuals write their own stories using set criteria. However, it is highly unlikely that a student would check this book out of the school or public library in order to learn how to write a particular type of story. Rather, this series might be useful to a classroom teacher, though teachers can find similar information online or in a single title with all of the genres included, or even in a language arts curriculum guide at a far cheaper cost. Although the information is neatly wrapped up in a convenient package and the content is fairly good, there is really nothing new here, and the individual titles are pricey. Perhaps a single title, with all of the text styles included, would reach a larger audience.